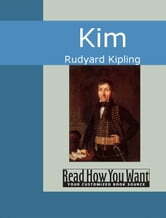 Published in 1901, Rudyard Kipling&apos;s Kim is portrays the Indian people, culture, and religions during the British rule. The story concerns Kimball O&apos; Hara, orphaned son of an Irish soldier stationed in India. Kim becomes the disciple of a Buddhist who is on a holy journey. Along the way, Kim is recognized by his father&apos;s regiment and is recruited by the British Army and thus involves in The Great Game.